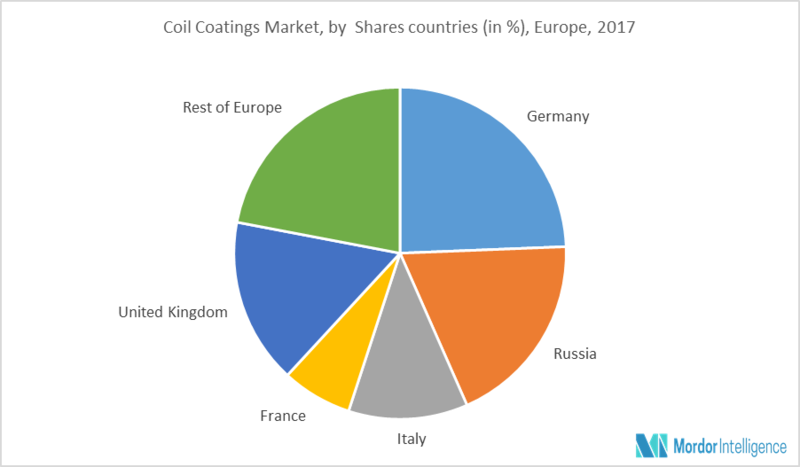 The Europe coil coatings market is expected to register a CAGR of 3.88% during 2018 to 2023 (the forecast period). Germany has the highest market share, due to its leadership in the automotive industry and excellence in engineering. It is, by a large margin, Europe’s leading production and sales market. In the recent years, the German automotive industry has consistently expanded its global position. Coil coatings find their application in the manufacturing of typical components, such as sheet and panels for containers, caravan and interior, insulated boxes, trailer bodies, road and railway coaches. The EU produced around 18.4 million motor vehicles in 2015, 23% of the motor vehicles produced globally. The increase in the overall production of automotive, is to drive the growth of coil coating market in the region. By material type, the demand for polyester type coil coating is likely to continue its growth, due to its superior physical and chemical properties, such as high resistance to chemicals, high durability for interior and exterior surfaces of buildings, and good formability. Polyester coil coatings are formulated for interior or exterior surfaces, and can be applied as one-coat application, or basecoat, or topcoat, where durability and protection from corrosion are needed. Germany is known for its outstanding automotive industry and excellence in engineering. Germany will continue to provide top-class technological performance through its outstanding infrastructure and research facilities. Germany is Europe’s biggest market in terms of production and sales of automotive. The country has the largest concentration of OEM plants in Europe, with around 41 OEM sites throughout the country. German automobile manufacturers produced more than 15 million vehicles in 2015, with 5.7 million passenger cars and 352,200 trucks and buses manufactured in German plants in the same year. December 2016: AkzoNobel completed the acquisition of the global Industrial Coatings business of BASF, and became the number one supplier of coil coatings in the world. Major Players: Alcoa, Novelis, ArcelorMittal, Tata Steel, and Dura Coat Products Inc., amongst others. 9.1.3 Dura Coat Products, Inc.